1) Building information modelling (BIM) is an approach to designing and documenting building projects and is gaining acceptance in many jurisdictions across the world. It allows all stakeholders and actors within a building project the seamless link between the owner, the designers, the construction professionals, the master builders and the end users. In an era where our profession works towards managing all information spatially, BIM is an enabling platform that should bring not only sharing and collaboration, but also avoidance of duplication, timeliness and value adding. This paper was presented at FIG Working Week 2012 in Rome Italy. The use of Building Information Modelling (BIM) has been adopted by the UK’s Governments Chief Construction Advisor, Paul Morrell, and promoted as the means by which all projects will be delivered within the UK. This will result in a change of methodology for all the UK contractors and provide benefits and obstacles that the construction industry will be required to embrace and overcome. This paper aims to look at the overall impact that BIM will have on the UK Contracting entities and analyse the benefits that may be bought to the construction industry through the implementation of BIM. The paper will also look at the legal concerns with utilising a system that aims to share information between contracting parties. BIM has been extensively used around the world for a number of years, especially in the US, but the adoption of the system within the UK has been slow. The implementation of the system is likely to speed up considerably however, especially now that the UK Government has decided to adopt the approach for all Public Sector projects. BIM provides the construction industry with a method of collecting and using information across a construction project. It aims to provide a seamless link between the designers, the client, construction professionals, contractor and end user of a project from the project inception through to the final decommissioning of the project after its intended life has expired. The utilisation of BIM also enables the designer, contractor and client to ‘virtually’ build the project before construction physically begins and therefore should highlight areas of concern which may effect or prevent construction, i.e. service clashes, component incompatibilities. 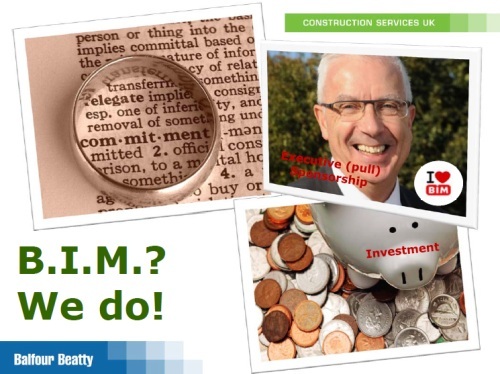 What is BIM? 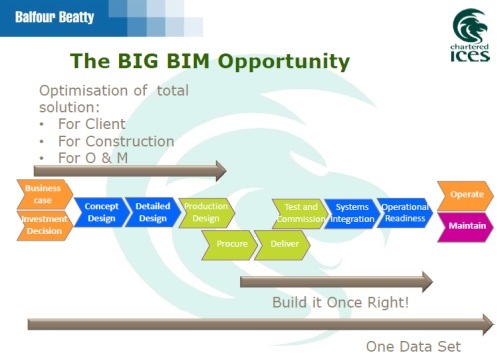 BIM can be described in a number of ways but can be described simply as ‘It can be the intelligent planimetric 3D modelling (in particular for the architectural world), and it is also the process undertaken through the lifecycle of a scheme. BIM can potentially add a lot of value to customer deliverables (Alexander Grounds MCintCES, BIM Consultant – Civil Engineering Surveyor Journal March 2011). BIM provides the Constructors with a visual communication which helps to assist all the stakeholders in a project. During the initial tendering stage of a project it provides the Contractor with a means to visually show a client how he intends to construct the project, and what considerations he has provided for within his design and price that best suit the clients’ needs. The information can be displayed visually, but be further supported by the traditional means of information from 2D drawings and programmes. Contractors are finding the system beneficial, especially because it utilises information that they have historically prepared during a tender process, but by the incorporation of this data into one ‘model’ the ability to present it visually, graphically and sequentially adds to their ability to demonstrate to a client how they intend to construct a scheme. The preparation of the model within the tender process also enables the contractor to understand and challenge the designers’ details. The system does require the designer to provide the information and also for the client and his professional team to liaise with the tendering parties to enable this process to drive best benefit. 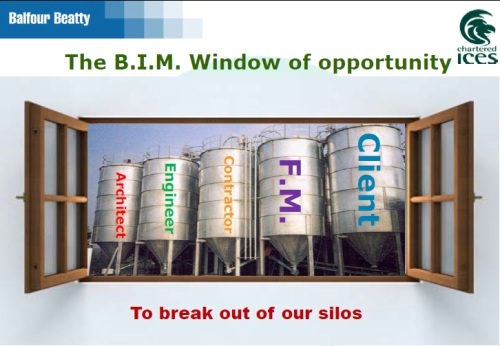 The process required by BIM fosters the need for all parties to a Contract to share information and break away form their traditional silo mentality to ensure that information is readily available to all parties and all parties interact in developing the information through to a successful completion. BIM also provides the ability to incorporate the thoughts and ideas of the greater supply chain. By the designers issuing the model at an early stage, the supply chain can look to further analyse the design presented and input their own ideas on build ability or product selection. This method of interaction was previously difficult to engineer as designs were generally set, whereas through BIM the design is open for all parties to review and discuss. BIM will also provide the ability for contractors to abstract material quantities from the model. This enables the contractor to accurately measure and quantify the elements of the structure efficiently and to a greater degree of detail than previously available. The provision of detailed quantity schedules for materials enables contractors to remove risk from their pricing models and ensure that clients are being provided with quotations that are based on precise data and data that should be consistent across all the parties tendering for a contract. Once the model is taken to the construction phase of the project, the general fact that the contractor is commencing works on site with a set of drawings he understands, a programme determining the methodology of the construction and a schedule of the materials he requires to construct the works, the contractor should find himself in a better position to commence the works efficiently and with reduced wastage in management time at the front end of a project. The model also enables the contractor to ‘overlay’ his temporary works design on the permanent design. This facilitates the construction programme by easily identifying difficulties in the design during the construction phase and has been shown to highlight areas where adaption’s to the design can generate considerable savings by making the temporary works simpler or easier to construct. The integration of both the permanent and temporary design is seen as a large opportunity for contractors. The contractor will also have the ability to look at the construction sequence within the model and determine where risks are apparent within the build. This ability to manipulate the data will provide the contractor with the opportunities to look for clashes in the construction process and by incorporating the design information into mobile mapping technology aid in the setting out of the scheme. On highway infrastructure build schemes the process is also being used to design and visualise traffic management schemes to see how they perform and whether the design will work effectively in practice as well as in theory. The use of project construction within the digital model has also provided benefits in regards to the safe construction of a project. The ability to see risks to operatives and trades prior to the works actually being physically constructed can provide major benefits for the health and safety of employees. Contractors have also found benefits in utilising tablet computers, which when linked to a GPS enable the user to walk around the construction site and see via the tablet the works that are to be constructed in that area of the site prior to any works commencing. This visual tool helps the contractors project management staff to ‘see’ where works are to be carried out and further review any areas of difficulty that may be apparent. Generally, it has been found that the use of the BIM model has reduced considerably the number of requests raised by the Contractor during the concurrency of the project for further design information or requests for clarification on design elements. This reduces the management time required on the project and also reduces delays and prolongation on the project itself. Once the project has been constructed the BIM model maintains its usefulness by providing the Client with an accurate model of the constructed building and an asset list of the components. The model can be used effectively for the maintenance and operation of the building. By providing a platform whereby all the parties contracting to construct a project have the ability to input into the design raises a number of concerns as to who holds the ultimate liability for the design. It is envisaged that standard forms of Contract will need to be amended to reflect the fluidity of the design and where liability is to be placed. On projects where the BIM model is to be accessed and contributed to by a number of parties the principle of appointing a lead designer who manages and co-ordinates the design within the BIM platform appears to be the most ‘workable’ solution. The effective remit of the BIM Co-ordinator would be that of managing the process of producing the model and ensuring its use and validity. The co-ordinator would be required to be appointed by the client as a member of the design team. The liability for design failures will ultimately rest with the individuals who have provided design information, but this distinction as to which party takes on which element of design needs to be clearly highlighted in the Contract Documents. It may also be necessary for Conditions of Contract to detail that collaboration with others does not affect the individual responsibilities of each designer. BIM raises a number of other issues in respect to the liability for design information which have as yet not been resolved. The sharing of information between the participants means that parties who have no contractual relationship will be providing information to one another. This is most prevalent with designers providing models that are used by sub-consultants to the Contractor. The sub-consultants utilise the data provided, but if this is found to be in error then the sub-consultant has no route to claim from the designer as English Law will generally not allow parties not in Contract to claim from one another when looking to recover financial loss. BIM does look to join up a number of parties through the ‘model’ and therefore the risk on errors within the model does highlight an area of law which will need to be addressed in future contract drafting. The use of BIM also highlights the concern of copyrights and loss of Patents. The model in its self will require designers and surveyors to provide information and data that they would have previously restricted the use of. The sharing of base information will also potentially divulge to third parties technical knowledge and effectively trade secrets that would have previously remained within the businesses. The methods likely to be adopted in preventing this loss of competitive advantage are the use of specific and carefully drafted IPR (Intellectual Property Rights) Licences and incorporating non-disclosure clauses for participants to the model. As BIM sophistication increases the risk to parties of breaching these IPR Licences and non-disclosure clauses also rises and will need to be addressed for all parties in the future development of contracts.